A fine picture, painted by the young artist R J Williams who studied at Carlisle College of Art and possibly at the Royal College of Art, London. 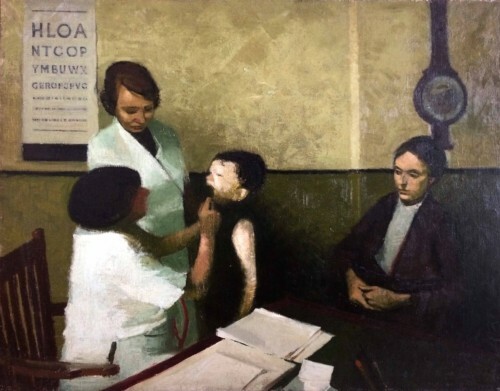 ‘A Visit To The Nurse’ is still a clear memory for many – the smell of ether and disinfectant wafting in the air. On 5 July 1948, the NHS was launched by the then Health Secretary, Aneurin Bevan, at Park Hospital in Manchester. For the first time, hospitals, doctors, nurses, pharmacists, opticians and dentists were brought together under one umbrella to provide free and equal health services to all of the nation.